Landis E. Hershey, 88, formerly of 1647 Old Philadelphia Pike, Lancaster, died Friday, August 26. He was the husband of Ruth Martin Hershey. ... Born in Leacock Township, Landis was the son of the late Chester H. Hershey and Anna E. Hershey. Landis was a bookkeeper for the former Lancaster Brick Company and was president and a member of the board of directors of the former Ezra W. Martin Meat Company for 37 years. He and Ruth attended Mellingers Mennonite Church where he served in many active roles. He was a board member and treasurer of Mellinger Mennonite Cemetery. Landis was an early proponent of Christian education and served as chairman of the school board at Locust Grove Mennonite School for a number of years. Landis is remembered by many for his life of service to others, especially as volunteer and regional director of Mennonite Disaster Service from its beginning in 1955. He was a member of the Lancaster Chapter of the American Red Cross and was also treasurer of Wayside Gospel Crusaders. He was well respected as a godly man of integrity and sincerity. I placed in bold the two references above that stood out. First, Hershey formerly lived at 1647 Old Philadelphia Pike in Lancaster County. That same address is printed about the bottom of the blue "Accept Christ" card. Second, Hershey was once the treasurer of the Wayside Gospel Crusaders. But that's it. Nothing further. From "The Mennonite Community, Volumes 1-3", published by the Mennonite Community Association in 1947: "...Replace that beer, liquor or tobacco sign with the WORD OF GOD Posters 8y2 feet by 20 feet [sic], for standard-sized billboards are available now. For additional information CONTACT WAYSIDE GOSPEL CRUSADERS Route 5 Lancaster Pennsylvania...". 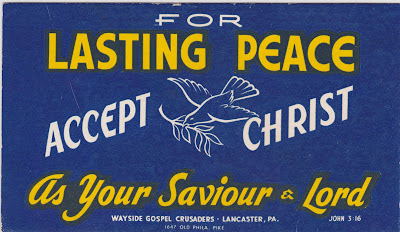 From "The sociology of Mennonite evangelism", a 1954 book by John Andrew Hostetler: "...The 'Wayside Gospel Crusaders' make and promote billboard roadside evangelism ... to bring men and women face to face with the Gospel, who possibly would not come to our church houses and could not be contacted in any other way." So the best information at this point is that the Wayside Gospel Crusaders practiced an earlier form of billboard evangelism2. What else the group did, how many billboards were posted, how long the group was active and other questions remain unanswered for now. I am sure, though, there are people in Lancaster County who can tell us much more about this group's history. 1. That's kind of, but not quite, a Googlewhack. 2. Billboard evangelism remains extremely popular today in the United States. A couple of current examples can be found here and here.